Military vehicle wreckage belonging to Islamic State militants is seen in Falluja, Iraq, June 18, 2016. Slow, steady progress by U.S. and coalition backed forces against the Islamic State terror group in Iraq and Syria could mean little in the wider war against jihadist organizations bent on striking at the West. This grim outlook, according to military and intelligence officials, stems from several factors, from poor governance and pervasive instability to the alienation of certain segments of populations. Combined, they say, these factors have undone long-standing cultural bonds and allegiances, turning parts of the Middle East and Africa into terrorist incubators. Complicating matters further is the feeling that military power alone, no matter how overwhelming, is not enough to deliver a decisive blow against IS or any other deep-rooted terror organization. “Momentum is in favor of the global jihadist movement,” he said. In some ways, the rapid ascension of IS and its bid to become the preeminent global jihadist organization have actually strengthened its competitors, most notably, al-Qaida. 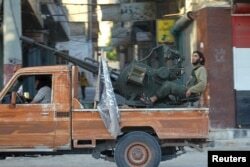 Members of al Qaeda's Nusra Front ride on a pick-up truck mounted with an anti-aircraft weapon in the town of the northwestern city of Ariha, after a coalition of insurgent groups seized the area in Idlib province, May 29, 2015. “Al-Qaida has prioritized [Jabhat al] Nusra as an affiliate,” a U.S. intelligence official told VOA on condition of anonymity. The official noted that the group has used the last two years to “retrench and rebrand,” emerging with greater strength on the battlefield in Syria and with more credibility, as well. And even though Jabhat al Nusra’s parent organization has suffered setbacks in Afghanistan, a one-time safe haven, analysts like Daveed Gartenstein-Ross warn it is a mistake to underestimate al-Qaida’s resources or reach. Thanks to its rebranding efforts, al-Qaida’s appeal even seems to be expanding. “Al-Qaida has managed to capture the echelon of Salafi jihadis who were repulsed by ISIS’ brutality but still have the ideology and want something that is just a half-step down,” said Jessica McFate, a former U.S. Army intelligence officer now with the Institute for the Study of War. McFate, like other analysts, also worries the demise of IS and its self-declared caliphate could give al-Qaida an even bigger boost. Equally worrisome, intelligence officials say, is the way groups like IS and al-Qaida are expanding their influence beyond the Middle East and Africa. The CIA, in particular, has warned of an upsurge of activity across the southern rim of Asia, where terror groups from Bangladesh to the Philippines have been increasingly connecting and interacting with “brand name” jihadist groups in the Middle East. And there are continuing fears about the global flow of foreign jihadists, many of whom have fought in Iraq, Syria, Libya, Afghanistan and elsewhere returning to their home countries with the intent of joining existing terror networks or forming their own cells. Intelligence agencies, especially in Europe, have accelerated their efforts to crack the networks and combat the threat. As for the ongoing military effort, U.S. defense officials say they are well aware of the concerns but point out the current counterterror mission restricts their focus to IS and al-Qaida. Some also argue that many of the underlying conditions helping jihadism to flourish cannot be fully addressed until IS is defeated in Iraq and Syria. Either way, it may be a losing battle. “ISIS and al-Qaida are growing, and there will be other groups that join them,” Hassan Hassan, a resident fellow at the Tahrir Institute for Middle East Policy, warned members of the Senate Homeland Security and Governmental Affairs Committee Tuesday.